Hey book lovers, Whats up? Hope you're having a beautiful day today, I know I am. 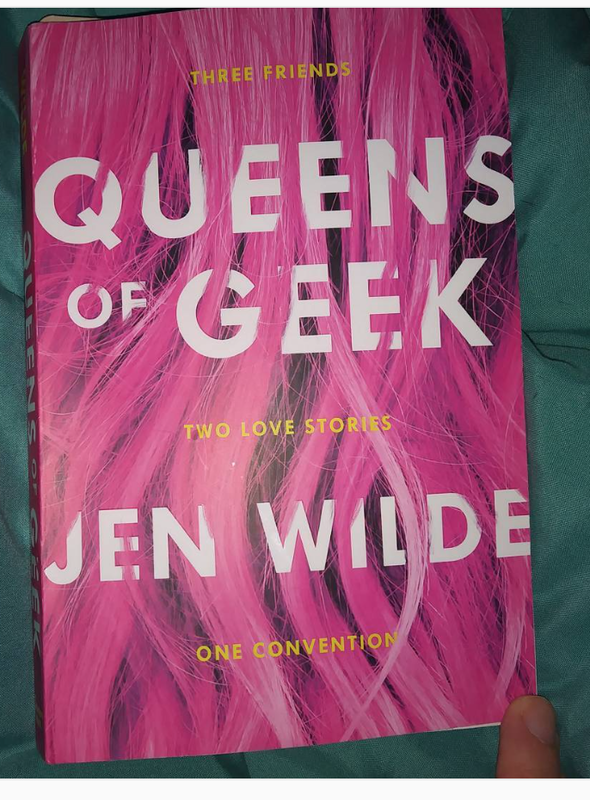 I just read this really inspiring book called Queens of Geek by Jen Wilde. I bought this book way back in March from Amazon and was finally able to get to it. I just can't believe how awesome this book so let begin with the review. This book involves three friends, Taylor who I believe is an Australian born native girl. She is the geekiest girl around in a good way. She is totally into this fandom Called Firestone which reminds me of Harry Potter. She just loves to quote movies and shows like the Gilmore girls do. But Taylor is also autistic and suffer from anxiety. She doesn't react or is able to catch on to things fast and the world doesn't really work with the way her mind works. If you're new to this blog and don't know this about me, I also suffer from anxiety and depression. I loved Taylor because I am so much like her. I am a huge geek, I love doctor who, but at the same time I don't always know how to respond to things. I feel like I can't understand what the world is putting forth. Sometimes I even feel like that I can't express these feelings or I will usually get the typical response of, why can't you just be happy, why didn't you know how to do it this way. These are things people with Mental Health experience every day. But in this book, Taylor is shown that there is nothing wrong with how her mind works, and it's okay to voice her feelings to the world. Don't worry about everyone else. These are things I can relate to on a very deep level as well. Taylor was so inspiring to me and I just love her point of view throughout the book. Then there is Charlie who is Taylor best friend. Charlie is an Asian American who moved to Australia, I believe. When she attends school for the first time is when she meets Taylor. As the years go by both girls become great friends. The only difference is that Charlie is a mega Youtuber who is a breakout Actress. Charlie is the reason that Taylor and their other friend Jaime get to go to this big press event in the book. At this Event, Charlie meets another famous Youtuber and someone she admires by the name of Alyssa. Things get heated between Alyssa and Charlie as the book goes on and they end up maybe being together. I just really loved Charlie Character, because throughout the book I felt like I could also relate to her. I am always Charlie in front of the camera. I am very outspoken and very outgoing but behind the camera in real life I am Taylor. Honestly being Taylor and dealing with Anxiety is the reason I have a hard time posting new videos a lot of the time. So I can relate to both Charlie and Taylor and its just one of the reasons I love this book so much. Then third is Jamie who is from America as well but moves to Australia because of his parents. He had a hard time with the move but when he spies Taylor reading Queen of Fire one day in School, he finally finds someone like him. Jamie is just this really awesome kind nerdy guy who loves Comic books and likes Taylor. But when he tries to make a move on Taylor the first time it didn't go so well. But when they are at this press event, Jamie seems to handle things much better. Maybe so much better, that Taylor and he might finally have a shot, who knows you have to read the book. So to sum this book up it's about three best friends finding different real scary reasons not to take a chance but do anyway. They end up having the time of their lives at a comic con of sorts. They all end up finding new meanings to new relationships. But the best part of all is that they learn no matter what your real friends always have your back in the end. They also learn that real love means you love someone no matter their messes. As for this book, I rated it five out of five stars because it was so well written. The messages about friendship and real love were so clear and defined. The only thing is that even though all three friends are in the book, its only totally from the views of Charlie and Taylor which is cool but I wish we had a view from Jamie too. But I did love how Jen wrote about Taylor Anxiety, it was related able and real. It felt and explain how anxiety looks from a personal standpoint that deals with anxiety. I just love the writing throughout the whole book, so much that I could not put it down. I had to force myself to put this book down to either rest my eyes or do something else. I cried through some of this book while reading it. I can't tell you enough that you really need to read this book. You especially need to read this book, if you suffer from anxiety or knows someone who does because this will give you look into their world. I also have to add that I was totally geeking out over all of the different nerdy references. References towards the made-up fandoms that were like the real fandoms, for example, Harry Potter but it was renamed Firestone for the book and change a little too. 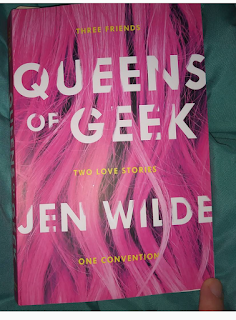 I just really loved this book, and the romance didn't hurt either. The romance was super sweet and very realistic between the two couples in the book. I suggest you all go buy this book right now and read it. I am going to go and link all of the information for the book below before I talk your ear off. Please be sure to follow and share this blog and all of my social media.